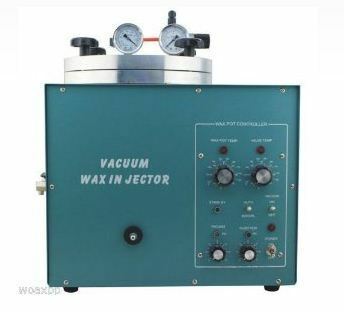 Vacuum Wax Injector Electricity Supply: Power supply220V/50Hz Power: 800W Temperature Range: 0-300℃ Wax Pot Capacity: 3.1L(3.2kg) Dimension:52×40×47CM Weight: 20kg. Specifications: jewelry machine casting machine vacuum wax injector digital machine high quality. Details: Voltage:220V, Single phase Power: 510W Compressed air range0.4–0.7Mpa Pessure displayed range: 0–0.2Mpa Temperature display range 55C- 85C Capacity: about 3kg Temperature precision: /-0.2C G.W.:20kg. Size: 400*270*450mm. We, Surbhi Chems, are well known organization established in the year 2000, at Delhi. We are biggest and leading name in the market as a Wholesaler, Exporter, Importer, Supplier, Distributor and Trader of Abrasives Items, Adhesives Glue, Bangle and Ring Tools, Bristle Brushes and Accessories, Buffs and Polishing, Scrapers and Deburrers, Jewellers Burs HSS, Casting Equipments and Supplies etc. These products are highly well-liked in the market due to their features such various sizes, easy to install, strong construction, low maintenance, and affordable prices. These products are made by our expert using the sophisticated technology and optimum quality raw material that is bought from reliable merchants of market. Our offered products are obtainable in diverse specifications. To develop these products, we have established a sophisticated manufacturing unit that is embedded with modern technology and sophisticated machines that gives consistent performance.